Bengaluru, Oct 23, 2017: Karnataka government has banned riding pillion on two-wheelers with engine capacity of less than 100 CC, giving effect to a 2015 court order. The transport department also banned registration of such vehicles. "Not only has the registration of such vehicles which have seats for pillion rider been banned, but also riding pillion on two-wheelers below 100 CC is prohibited," said a government order issued by the transport department on October 13 last. The order was issued based on a Karnataka High Court order in a case relating to award of compensation to Hemanth, a minor riding pillion who was crippled for life following a road accident in Mysuru in March, 2009. Hemanth and Nithin, who was riding the two-wheeler without a licence, were both aged around 14 then. A recklessly driven car had crashed against their vehicle. While Nithin escaped with minor injuries, Hemanth was crippled for life with serious head injuries. In its June 15, 2015 order on a petition related to compensation claim by parents of Hemanth, the court had taken note of violations of rules and issued a slew of directions to the education and transport departments and the police to prevent minors from riding motor vehicles above 50 CC. It had directed that to avoid repetition of similar situation, the transport department should not register vehicles below 100 CC with a pillion seat attached to it and not permit riding pillion on such vehicles (already registered). 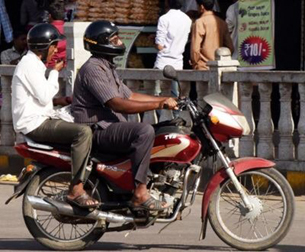 There should not be any seat for pillion riders in vehicles below 100 CC as mandated under Rule 143(3) of the Karnataka Motor Vehicles Rules - 1989, the court had said.